The RKB-850 and RKB-D850 are rated at 8 x 50 watts RMS into 8 ohms all channels driven and can double that output into 4 ohms as a result of their sophisticated, efficient Class D design. The amplifiers are rugged and extremely reliable. Yet, Rotel has gone further to maximize long service life, utilizing dual thermostatically controlled fans to exhaust heat away from the output modules and power supply. Both the RKB-850 and RKB-D850 feature input linking through input A on the rear panel allowing the analog or digital signal on input A to be routed to all three other channels saving time and additional wiring. Analog input A can also be summed to mono, allowing two channels of summed stereo-to-mono output. If input A is set to mono and the link through feature is used, all 8 channels will share the same mono signal – ideal for covering larger areas where normal stereo operation is not desired, for instance landscape audio or commercial applications. A rear panel RS232 connection allows connection to automation systems to provide control and feedback. 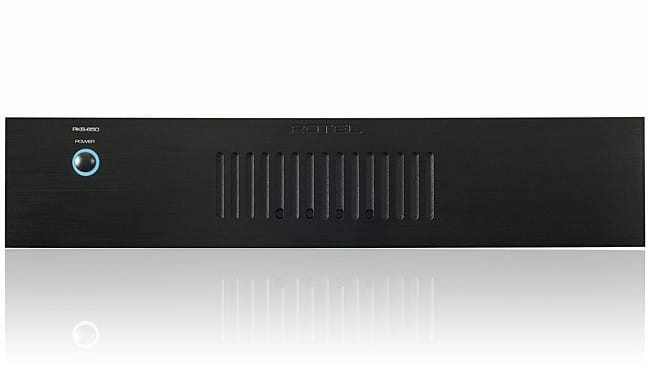 The RKB amplifiers also include 4 front panel trim pots which allow easy level adjustment to balance zones. Where the amplifiers differ is in the type of input options. The RKB-850 is an analog input only amplifier with four stereo pairs of RCA connectors. The RKB-D850 features four TOSlink digital inputs with individual stereo DACS for each pair of channels in addition to the four analog inputs. When a digital audio source is detected on the TOSlink input the unit will automatically switch to the digital input. If an analog input is connected, that source similarly will be detected. No user configuration is required. Each digital input supports up to 24 Bit/192 kHz LPCM audio. The RKB-850 and RKB-D850 share many common features including 12-volt triggers, 5-way speaker binding posts, a buffered analog audio pre-output to connect additional RKBs, and an IEC power receptacle with detachable cord. Their 2U height takes up a minimal amount of rack space and the RKBs can be stacked together without the need for rack spacers to maximize rack efficiency.